The Australians have been all over Sri Lanka’s head, quite literally. A day after Dimuth Karunaratne was hospitalized after being felled by a Pat Cummins bouncer, his teammate Kusal Perera retired hurt after being hit on helmet by Jhye Richardson on Sunday. The incident happened in the 53rd over of Sri Lanka’s innings, when Perera decided to duck underneath a not-so-short delivery. The ball hit the back of the helmet as the neck protector came off. 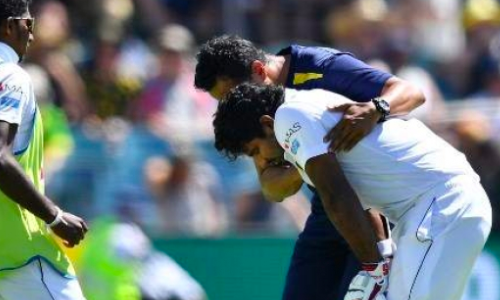 Although Perera suggested he was fine – he even continued after a brief medical attention – he apparently felt dizzy soon after and was taken off the field. He was replaced by Karunaratne, who was deemed fit to continue earlier in the day. Sri Lanka, meanwhile, were 17 without loss at stumps on Day 3 in their mountainous quest to chase 516 runs. WHACK! The Sri Lankan batsmen have copped another knock to the head after this Jhye Richardson bullet crashed into Kusal Perera. The batsman is thankfully OK.